This may come as a surprise to you, but I want to give all Y2K’ers a big pat on the back, maybe even a little hug. They have really gotten a bum rap since January 1, 20o0. In 1999, thousands and thousands of Americans, and others around the world, began stocking up on MREs, water, toilet paper, and who knows what else. Many people overspent on their preparations, and when it was obvious that nothing bad was going to come from the clock ticking that final second of 1999, they had to return to work and face their skeptics and put up with the mockery from their own family and friends. Then, had to recoup their financial losses by selling their stocked goods on ebay and in garage sales. That couldn’t have been fun! Here is where they have my admiration, though. In 1999, our economy was strong, our country was secure, and life in America was great. These cautious Y2Kers looked at the stability around them and went ahead anyway with their stocking up. It took a lot of courage to look at an uncertain future, and in the midst of security and prosperity say, “I’m going to do whatever it takes to make sure my family and I are safe.” That’s not much different from preparing for a hurricane that suddenly changes its’ track and heads in a different direction. It’s very difficult, in this day of instant news, to separate hype from truth, and the media was certainly doing everything it could to increase the hype back in 1999. Heck, the same thing happened last year with the Swine Flu “pandemic.” How many of us were toting bottles of hand sanitizer everywhere we went? 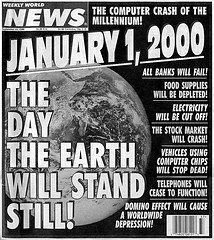 The downfall of Y2K preparedness was that it focused on a single event. Today, preppers are taking a much longer view of things, knowing that preparedness efforts put into place today might not be needed for months or even years. That’s why we talk so much about taking practical steps and putting to use what you store. Some preppers choose to increase their preparedness by becoming trained in practical skills, something always in demand. Our future now is far more uncertain than it was back in 1999, but many of those who stocked up for Y2K are saying, “Never again!” If you’re in that group, I want to encourage you to take a closer look at our economy, the state of our nation’s security, and even your readiness for severe weather events or a job loss, and take just a few baby steps to prepare. I promise, you don’t have to purchase another MRE if you don’t want. Freeze-dried macaroni and cheese is much tastier!